These All-Clad dual surface reversible drying mats are made with 80% Polyester and 20% Polyamide making this drying mat #1 in absorbency. 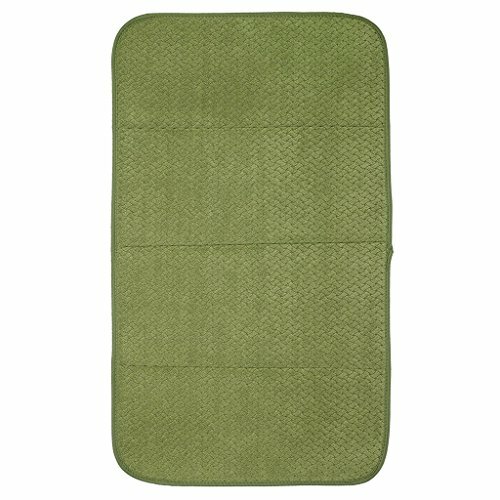 This drying mat is dual surfaced: one side of the drying mat is made with a polyester mesh that is perfect for drying glasses as it helps eliminate condensation and fog inside the glassware; the other side is a plush pile microfiber which acts as a cushion for anything from delicate china to durable cookware. The extra thick foam inside helps protect your glassware and dishes all while keeping your countertop dry. This dry mat comes with multiple folding options to fit small-to large countertop spaces and provides easy storage options. For longevity, please machine wash in cold water with like colors, only non-chlorine bleach when needed, and tumble dry low. Do not iron, do not use fabric softener and please note that dark colors may bleed and should be washed separately. These dry mats come in 6 beautiful, core kitchen colors. Reversible with multiple folding options for any counter size. Plush Microfiber to protect delicate dishes. Made of 80% Polyester & 20% Polyamide. 8 Different Color options to fit any kitchen style. SUPERIOR DRYING. This high performing dish drying mat absorbs excess water and keeps countertops dry better than any other dry mat. STAY DRY. Made with polyester mesh and extra thick foam to protect your delicate dishes and eliminates condensation and fog inside glassware. FITS ANYWHERE. This dish dry mat comes with multiple folding options to fit small to large countertop spaces and provides easy storage. COLOR OPTIONS. These drying pads come in 6 beautiful, core kitchen colors perfect for any household. MACHINE WASH. Wash in cold water and tumble dry low.